The specification and prices for the much anticipated Mercedes SLC have finally been revealed and it will be cheaper than the SLK it replaces. The basic model will be the SLC 200 Sport and prices will start at £30,495. This model comes with a 2.0 litre turbo petrol engine that produces 181bhp and is £3,000 cheaper than the SLK 200. For those who like more performance from their roadster, the SLC 43 AMG will have a V6 engine producing 362bhp and will cost from £46,355. That’s a stepdown from the current SLK 55’s output of 416bhp from its V8 engine. Mercedes are using a 2.0 litre four-cylinder turbocharged petrol engine for the SLC 200 and 300 models which will produce 181bhp and 242bhp. The engines will be coupled to the firm’s nine-speed automatic gearbox which has helped emissions in the Mercedes SLC be lower than the SLK and they come in at 137g/km for the 200. 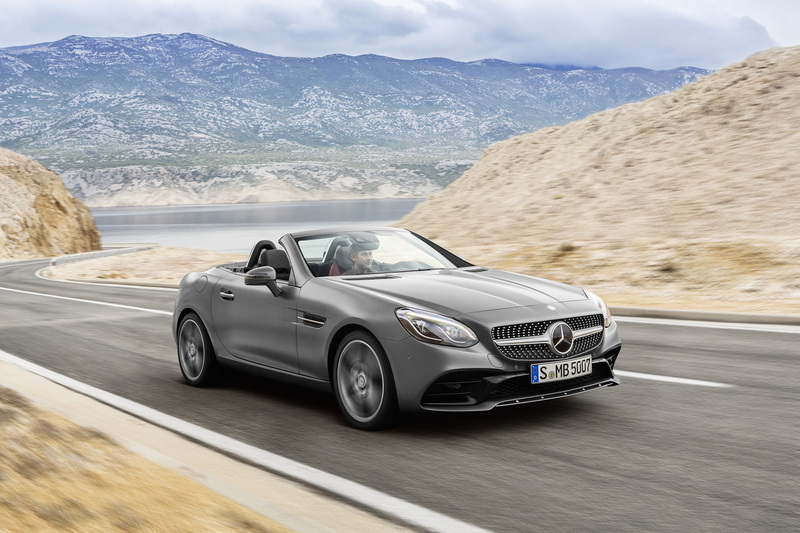 The most frugal of the Mercedes SLC line-up is the SLC 250d which will return 64 mpg and will cost £32,995 – it’s also an agile engine and will sprint from 0 to 62 mph in just 6.6 seconds. This performance is topped by the SLC 43 which has a twin turbo V6 producing 362bhp and it will cover the same test in 4.7 seconds with a 155 mph top speed. Even though the Mercedes SLC is a new car for the German carmaker, it’s actually a facelifted SLK and comes with new larger air intakes and a front bumper. Other improvements include updating the rear bumper, adding angled exhaust pipes and a chrome trim. The hardtop roof can be opened and closed with the Mercedes SLC travelling at speeds of up to 25 mph. However, the interior for the SLC is much different with a new steering wheel and aluminium trim highlights. Mercedes have also added a 7-inch touchscreen to the dashboard which features Bluetooth and USB connectivity, satnav, DVD player, Internet radio and 4G access. There’s also the option of adding equipment including the AMG body kit and interior trim upgrades, 18-inch alloy wheels and a leather trim. As you would expect from Mercedes, there’s a lot of safety kit on board including a system that will apply the brakes when it detects an imminent collision as well as lane keep assist and traffic sign monitoring. The Mercedes SLC is available to order now. This entry was posted in Car Leasing, Cars, New Cars, Sports Car and tagged Mercedes SLC by Steve Lumley. Bookmark the permalink.